I have to credit two people for transforming cities around the world, starting in the US, into horizontal, that is, flat cities. I’ll show you a picture of both of them. Their world impact has been incalculable. 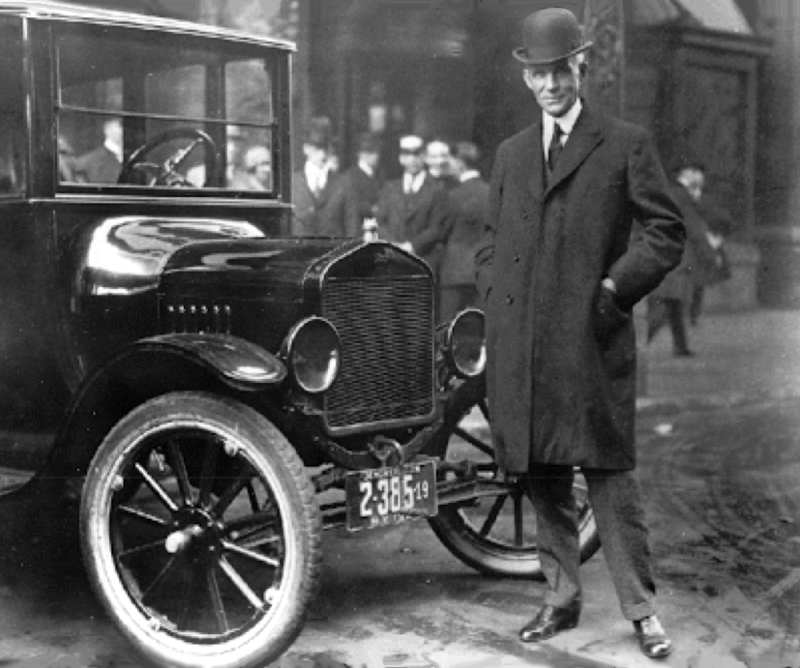 First is Henry Ford who created probably the most efficient of manufacturing advances – the assembly line – and flooded the planet with cars, of course with co-conspirators in the millions, being all of us who bought them, including myself. He (plus we) thereby created the most inefficient physical structure known to history: sprawl. 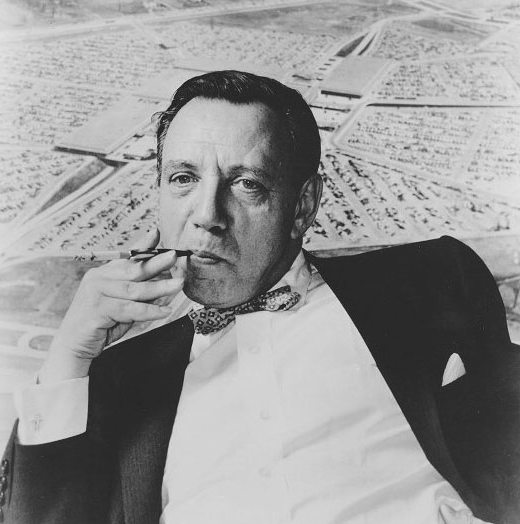 The other was Victor Gruen about whom architecture critic Malcolm Gladwell said, in The New Yorker Magazine, he “…may well have been the most influential architect of the twentieth century.” In a word, he was Mister Sprawl, ironically seeking in America to design and build pedestrian environments as best he could. But as he remembered pedestrian centers in Europe, not so acceptable in the US. To gather people together, influenced by Ford and his… Fords, he had to supply the people of the country, already well on their way to automobile infatuation and dependence, with a place to park. His first big one, 159 acres, mostly parking lot, was Northlands Mall in the suburbs of, appropriately enough, right next to the birth canal of millions upon millions of cars, Detroit, Michigan. The rest was as they say, history. Above, Mr. Ford with his model T and below, Mr. Gruen with his Detroit Northlands Mall on the wall. But now another strain, or theme, or contribution to history is developing on the side, one of sanity and a hopeful future, subject of this article: at the foundation of the evolution of the ecocity movement, the harmonizing of the horizontal and vertical resolving into the healthy three-dimensional. I think I have a special place in reporting on that history as an involved reporter of sorts and designer of dreams along the ecocity way, and analyst of projects aspiring to be “ecocity.” It started with a bit of luck when I was 21 catching a ride with the mother of a friend across Arizona to Los Angeles, city of the future where cars and sprawl were made to look healthy when we (I was there at the time) solved the local air pollution problem by putting smog devices on cars. That led to the impression that the city of highest (car) mobility was a God anointed good and so the cities of the world were melted out across the surface of the land as if dissolved in a liquid, being gasoline, almost oceans of it. That luck via hitch-hike ride delivered me to Paolo Soleri’s doorstep in a part of Phoenix called Paradise valley in 1965. My friend’s mother was trying to help Paolo find land for his experimental city, which was Arcosanti, established five years later between Phoenix and Flagstaff, Arizona. So we stayed overnight, while she engaged the search with Paolo and I began reading his papers and looking over his drawings, models and the very interesting structures he was already building as his office, workshop and architectural demonstration project called Cosanti. Cosanti, he said with a hint of a sly smile, enjoying the ambiguity, meant before things. Or then maybe it meant against things. 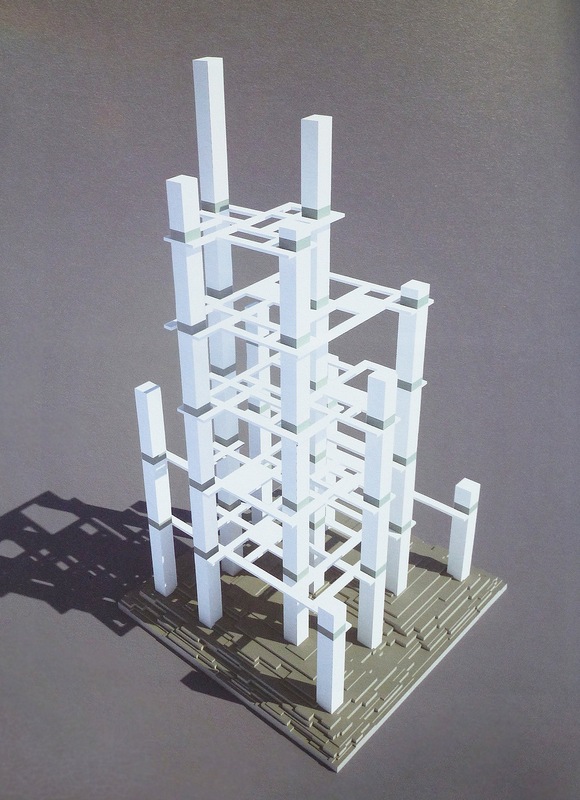 But what I’ll do here is build up the insights as an exercise in three-dimensional geometry. The key characters involved will be, starting with the more two-dimensional approach, industrialist and inventor, David Hall, then Chinese-American architect and editor/author/publisher of the book Vertical City – a Solution for Sustainable Living. Lastly I’ll address the thoroughly three-dimensional of Paolo Soleri, known pretty much equally as architect and philosopher/cosmologist. My own role: look that all over and add some insights as I can. And what I think I see is the sweep of that geometry as important in creating the best of possible, not “perfect” (which would likely be boring anyway), future cities. In fact, cities are such an enormous undertaking and creation, their destiny is largely the destiny of, more broadly and simply put, the future. 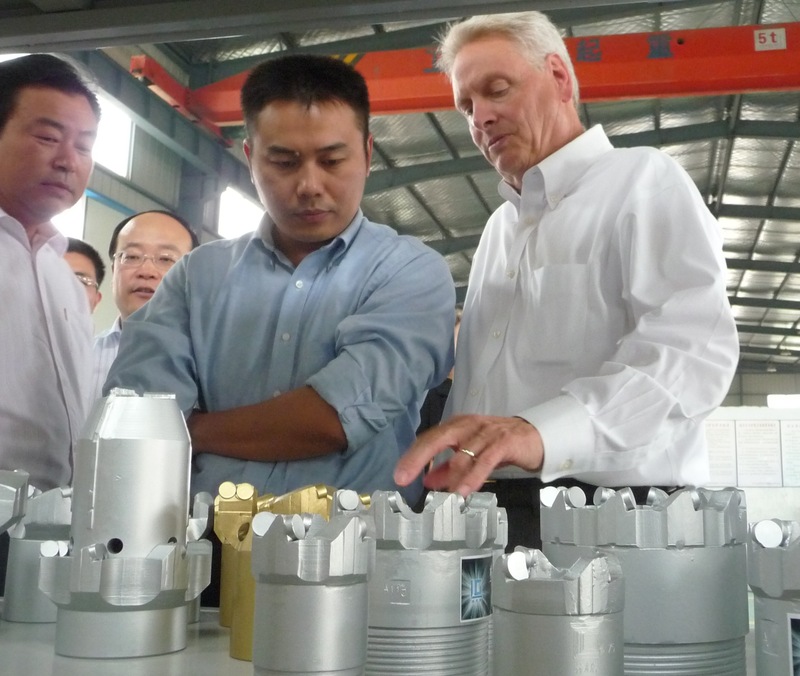 David Hall, right, looking over artificial diamond technology in Huaibei, China on a trip with Richard Register and Kirstin Miller hosted by Wang Rusong, 2009. 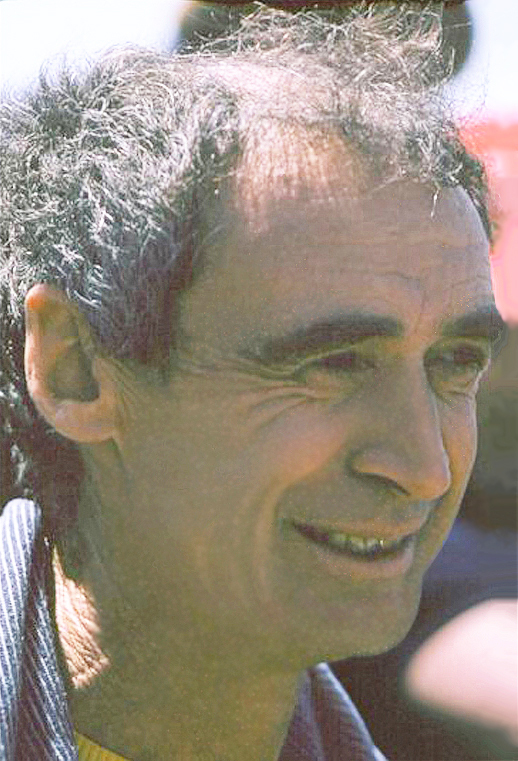 David’s father, Tracy Hall, invented industrial diamonds in 1954. David has his own patents he now uses in making his own diamonds, mostly for drilling equipment. But not to worry about criticizing other ecocity ideas in this newsletter and in the context of his own writing David says, “I invite all to critique the concept and help discover and innovate how the pattern could best be implemented.” So let the conversation flow, the subject matter is crucial. I’d say first off the urban design pattern he puts forward itself, which he calls NewVistas, is questionable as a system that should be universally adopted but elements within it, certain specific features such as a commitment to being car-free and designed for high local food production are very “ecocity” and I believe are important in the pallet of painting a healthier future. We’d need to be selective about what to implement based on the more three-dimensional principles for the larger scale I’ll try to exhibit later in this article. Hall implies that by filling up the world he would not mean displacing the natural species of Earth. No he insists, healthy vivacious nature must remain. But it sounds like a contradiction to me, like the Old Testament instructions to subdue and exploit nature, rather than cooperate for mutual benefit. Remember, those were radically different times when wisdom roamed the desert and when human population was probably 1/100th what it is now and therefore wisdom itself had a vastly different context. We are already down to less than 3% of the mammal weight on the planet remaining free and wild – 31% approximately of that total weight is simply our bodies, and more than 66% is constituted of our food animals and pets. That’s worth including here as a chart I drew for one of my earlier articles herein. 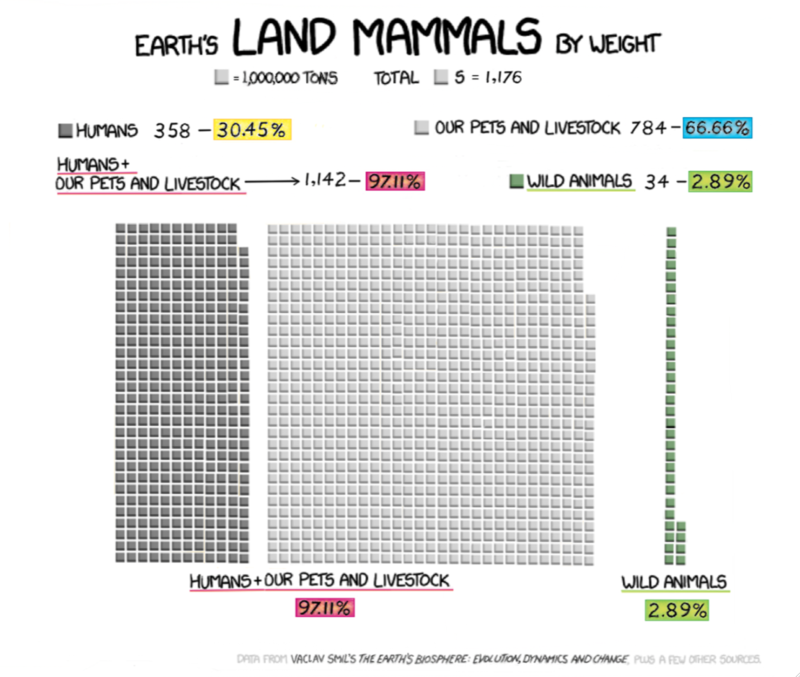 “Let Every Man Live…” Well, that’s OK if we slow down our reproductive rate reasonably so that other creatures may live too… That’s the biodiversity and biomass problem I try to illustrate graphically with Professor Vaclav Smil’s statistics above as percentages and below as a graphic, showing how we hover so close to the brink of even more devastating extinctions than we humans have already visited upon the Earth. I believe this issue has to be engaged with a real sense of human generosity not only to itself but everyone else too, all those other animals and plants having their own selfhood after all. But on to the geometry, the main point of this article. The land use pattern Hall puts forward is essentially this: strips of buildings in a grid layout of row house pattern rising two or three stories above ground depending on the slope of the land, some with basements essentially connected to passageways for “pods” which are small public transport vehicles operating mainly, maybe completely, underground. These look essentially like the four-person pod system at Masdar in Abu Dhabi, which I’ve had the chance to experience myself, down in the dimly lit basement there with no views but of walls. Not a pleasant walk of bike ride in the fresh morning air and breezes. Between these strips of development are NewVista’s much larger acreage given over to farming with the intention of being extremely high productivity utilizing both organic and high-tech methods to try to supply the world’s food required for all us humans. I take him very seriously in his personal expressions to me for his concern for feeding a hungry world. No problem with that at all. The roofs of his row housing, also called “zero lot line” or attached apartments, I should mention, are also farming in the form of boxes with soil and plants open to the sky or covered as rooftop greenhouses. Looking straight down from directly overhead, other than foot and bicycle paths, almost the entire landscape of the community built infrastructure and landscape surface is food production in one form or another. But then, go to the NewVistas website and be confused because what was farm between the grid arranged row houses, as in his beautifully rendered images of overall development including varied and intense production gardens in large land areas enclosed by row housing, is no longer labeled agricultural but mostly “commercial/residential blocks.” The proportion of farming surface looks to then decrease very substantially. Some areas in the platting layout also show “industrial” replacing what in other illustrations is green for farming. When developing ideas I understand refinements change and a kind of ghost image remains on websites while they are being updated, but these changes leave me confused as to the real proportions advocated. A key element is the community centers of buildings five stories high, spaced sparsely among the strips of housing, including an underground layer featuring sports and exercise areas, meeting rooms and other activities. Here and in some cases on the first floor in these social, cultural, economic centers we have meeting halls and rooms, shops for the usual items, administration and business offices, schools, neighborhood clinics, places for religious focus important to him and so on. The basement swimming pools? I would never have “hung out around the pool” as an adolescent in such a dreary underground environment, loving the sun and fresh air as I did – and still do. I would have taken a walk in the forests nearby with a friend, splashed about in a river, watched a movie, puttered around in the garden, studied an assignment, worked on my sculpture – almost anything in preference to being by or in an underground swimming pool. For dividable assembly halls into smaller meeting rooms and the like with folding walls of big “pocket doors” – excellent. My favorite multi-use building, and I admit this is a little weird but fun to contemplate, was in use for about ten years in old wild West Berkeley, California when it was called Oceanview, a.k.a. Ocean View, I think around 1875. That was a big two-story building with third floor ample attic. It was earlier and later a house with very high ceilings that got used those ten years as a small kindergarten/grade school that moved in due to demand for those services. Then by night, that ground floor served as a bar, or maybe called a saloon in those days. Inappropriate? One wonders about shifting furniture, stores of drinks and school supplies and storage spaces to accommodate such. But maybe what’s needed by circumstances really is “the mother of invention.” Some multi-use efficiencies really work, some only under special circumstances. I think some of David’s technological innovations really are excellent but the uniform repetition and five story height limit for the centers and the three stories plus rooftop farming preclude the “anatomy analogy” I’ll bring up shortly. You can do a lot with five stories and this is probably OK for village and small town scale, but a little taller would help express the value of three-dimensional design if the model is supposed to influence development more generally, that is, everywhere. In a sense his strips of housing aren’t just that alone but rather, on the scale centering around somewhere between low and medium sized, quite dense with a medium range of diversity, from farming on the roof to all the chameleon changeable features within. So to add some up, the NewVistas offering has car-free, high food production and a dense concentration of a variety of functions in the rather small scale range. Meantime, the uniformity of measurements offered, despite the fact that all of us are so different in many ways – our sizes, habits, pleasures – which I hope is for general guidance and not to be taken absolutely literally, lack of terracing, setbacks, conspicuous exploitation of best sun angles and so on is not much fun for the eco-designer in me. The more three-dimensional can be expressed in a wide variety of features like the terracing just mentioned and special treatments around plazas both on ground level and elevated, bridges between buildings and alleyways and gallerias penetrating built infrastructure and on and on in other notions of ecocity design, especially those that encourage walking and “pedestrian permeability.” I take as my guide the magnificent apparently chaotic model of natural environments – variety in the extreme in most cases – with their at first glance confusion actually being an overlapping of highly complex creatures and overlapping systems of species populations and individuals each in special ways navigating their way through their private lives in the almost infinitely complex public lives (ecological zones) of us all: people, animals and plants. I do have to leave the subject with one more thought. David says he doesn’t see why 15 billion people should be that hard to feed at a descent level of comfort and standard of living if the NewVistas’ pattern is applied and if details are built, down to incredibly specific and uniform dimensions he lays out for practically everything. But why not think in terms of actually gently backing off from such enormous population numbers, while say easing off on the demand for land for agriculture and giving more back to natural critters? Or conversely, where will it all end? If the dream is to increase food production forever like economists think constant growth is the normal healthy condition in the world’s limited environment, why not an even higher population, say 25 billion if the whole world can be filled up with people and ever-higher food productivity for humans? Even looking with a cold eye upon 15 billion human earthlings there must be some point at which the idea of healthy limits comes to mind. My closing geometrical generalization on David’s offering is that it adds a small amount of the vertical dimension, approaching three-dimensional integration of horizontal and vertical in small degree. It is intriguing how he imagines many systems complimenting one another in close proximity in his mainly residential row housing and community centers for small town scale application. But the system seems to me most powerful in terms of simply banning the automobile – making NewVistas profound, even for just that one step. Finally and fundamentally there is the conviction to do something about higher production agriculture, also very helpful. 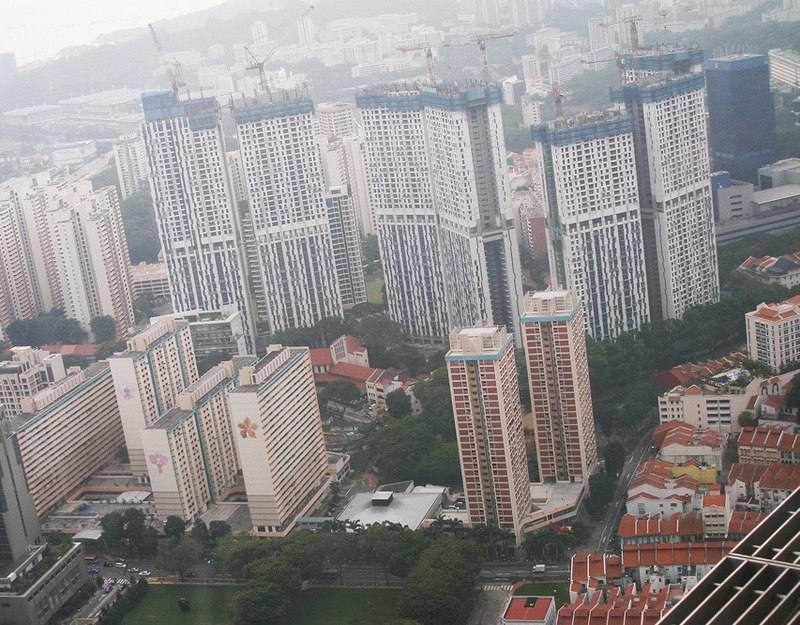 In his book Vertical City – a Solution for Sustainable Living, Kenneth S. H. King advocates passionately, almost desperately, for what we might think of as a new kind of vertical tending horizontal and eventually the three-dimensional city. 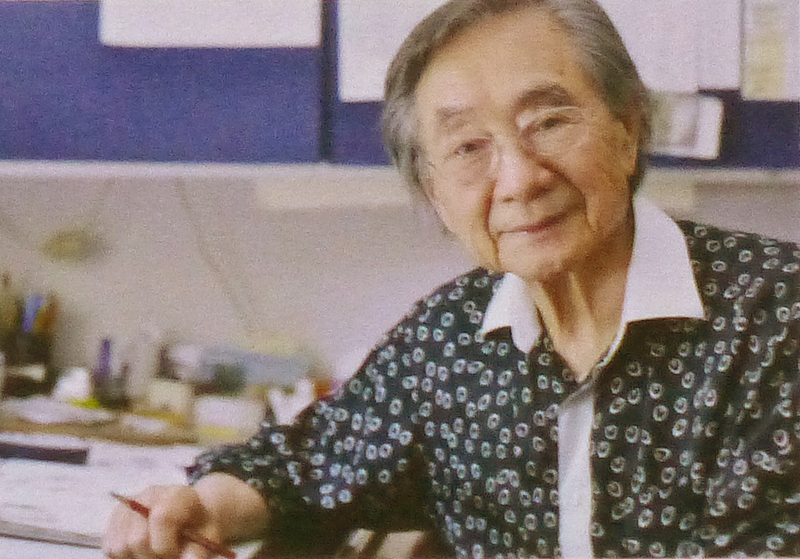 His book features 30 long, detailed, satisfying interviews with architects, planners and sundry visionary with introductions, commentary and conclusions from himself and co-producer of the book fellow architect Kellogg H. Wang. I’m delighted to have 16 pages therein with six of my drawings. Kenneth King has dedicated the last several years of his life preparing his big book to try to warn us of the error of our ways in development that swamps the earth in a thin layer of suffocation while instead in the same book he offers his notion of how to turn things around by building a tall version of three-dimensionality. Like myself in my book World Rescue – and Economics Built on What We Build, his book Vertical City is another bold effort to offer solutions enough to attempt a genuine rescue operation. What I mean by “vertical tending horizontal” is that his book features mostly architects talking about building to extreme heights, most of their products discussed in Vertical City – a Solution for Sustainable Living being the world’s tallest spires high into the sky. Ken King, who I now think of as Ken having come to know him as a new friend, seems frustrated with the very same architects, builders and technologists to whom he gives 580 pages of ink: only a few of them, he laments, think much about horizontal integration for their towers. Meantime the super tall buildings standing separate like wires lanced into the clouds, give enormous floor area proportion per “floor plate” to accommodating elevators to gain such heights. In the elevator business, with a couple good interviews in the book Vertical City on that specialty, the rule is that with steel cable elevators – almost all there is of elevators these days – you can only go so high before the weight of the cables becomes too heavy to lift any more. Another standard in the business is “no more than one transfer,” in other words no more than two rides, for the person trying to get to his or her destination in one of the very tall buildings. People just get too frustrated with more transfers than that. That means a height limit of something like the Burge Khalifa in Dubai at 2,720 feet, currently tallest building in the world, or as tall as two Empire State Buildings plus an extra 200 feet. However, lovers of super tall buildings are now working on “ropeless” elevators that work on principles something like magnetic levitation trains. Later for explaining that; would take too much space here. Others in his book think super tall buildings make little sense except as city or nation branding, indirect mean of attracting business and investment and therefore promoted by governments and businesses that might profit, but subsidized in perverse ways, as Dubai is for example subsidized largely as a place for and by the very wealthy showing off their wealth and disposing of it absurdly and for the most part in wildly wasteful excess. For example with their indoor ski slopes with icy artificial snow when it is 115 degrees F outside. Despite the predominance of tall towers in the book, Vertical City has a fair number of architects expressing the opinion that such buildings are not genuinely sustainable. Like any good conference organizer, anthology editor, etc., Ken has assembled a wide variety of perspectives around a topic that needs serious attention – and lets the actors play their roles as best they can. Back to essential geometry, Ken notices that if there were a few, not one but say six or so towers linked by horizontal bridging, but bridging more on the model of platforms at various levels rather than only linear bridges, there could be neighborhood centers in the sky. In the tower designing and building business, when you have a level where many people get off an elevator to transfer and continue up or down vertically on another elevator, that level of transfer or “floor” is usually called a “sky lobby.” Ken is advocating for extensions of those sky lobbies into platforms connecting towers where there are highly mixed uses, services appropriate for the building cluster, some maybe complete enough to function, as suggested, as real neighborhood centers. Ken says really thoroughly thought out designs have yet to come. In my reading the whole book, I think perhaps architect Anthony Wood says it most simply and persuasively in his interview in Vertical City. He’s an associate professor of Architecture at the Illinois Institute of Technology who did his PhD dissertation on the use of sky bridges between tall buildings. In addition, he has been Executive Director of the Council on Tall Buildings and Urban Habitat since 2006. Says Mr. Wood, “For many years I’ve been fascinated by the idea of horizontal connections between tall buildings. It started as a kid with futuristic films showing linked towers in multi-level cities, but is it just science fiction cinematography?” He says that, in a piecemeal way it is beginning to happen and he provides the examples of the two linked towers of Kuala Lumpur’s 88 story Petronus Towers and Singapore’s sensuous footprint set of seven 55 story residential structures linked by two levels of bridges above ground level called The Pinnacle @ Duxton, which I had the pleasure of photographing as a model in the planning office of Singapore after I gave a talk there, then photographing the real thing from a vegetarian top floor Chinese Restaurant actually looking down at the nearing complete structures in construction two hours later. Anthony Wood says also, “What’s absolutely crazy is we keep going vertical without bringing in the horizontal plane.” But regarding the super tall buildings themselves he says, “Apropos of sustainability, there comes a point where there is no energy, carbon or financial sense just in going further upward.” He doesn’t suggest what that point is: 50 stories, 150, 25 possibly? Maybe he doesn’t venture a guess because he is after all Executive Director of the Council on Tall Buildings and Urban Habitat and the issue is likely to be hotly debated in that institution. He points out that in the earlier days of very tall buildings, corporate entities motivated and organized the projects. But now the buildings are so gigantic, resources-demanding, complex and expensive that cities and whole countries are need in their promotion and development. Such structures require disproportionate investment to get them yet higher. Why invest in them? People get impressed. It is stupendous to go that high of course. You get a lot of attention. There is the exciting fear of falling when you don’t actually have to fall, the vertigo adrenalin rush and the ego of challenge to build that fantastically, met and overcome. It is a brand of creativity after all, a brand of humanity proving itself worthy of the gods, the laboriously designed, planned and executed opposite of the quick and deviously cunning but ultimate stupidity of war. Your edifice can be seen from the next county over, maybe even the next country: that’s great advertizing. The returns are based on that: the branding of a city or country as a good place to invest your money, a place of high status, the higher above the streets the higher rents and the higher the status. But it is not guaranteed society will think this way forever, especially if claims to sustainability are examined more carefully. Could such buildings be built without this branding and snake-eyed fascination? Could they without this psychological impressiveness exist just for services to residents, businesses and following generations? (I left Rome more beautiful than I found it, as some Emperors were said to have said.) The “in” mystique of the whole thing, it seems to me, is the real source of the investment and the return. It’s not simply the pay out in capitalist mind set ways. The payout runs for pride in us to ego for me… and if we do have a business there, people will know and think we are in style or successful – nice to rub shoulders with us, do good business by charging customers higher prices for their status seeking purposes too. Even tourists posing before these things to show pictures back home are supporting the building of very tall buildings, with the money they drop in town and the word like advertizing they spread when they return home. Moreover, Wood points out if the embodied energy and materials are figured in to the lifetime of the super tall buildings, and sustainability is not figured in just the running of the building on renewable energy sources and with best of insulation and other conservation particulars, there is no way that such buildings could ever be called “sustainable.” Advertizing them as such leaves out the total picture. When it comes to sky bridges connecting buildings, why isn’t it done more? (It’s actually increasing steadily as I write.) Anthony Wood says, “Because it requires a hell of a lot of joined up thinking, and we are not evolved enough as a species specifically through forms of government and planning, to allow it.” Government sponsorship, planning and guidance are definitely very, very helpful. Meantime, why does Kenneth King invest so much of his life in promoting extra tall buildings linked by bridges, in producing his book, Vertical Cities as an intense labor of love and a near desperate attempt to densify cities in the extreme, while taking up an extremely small portion of the Earth’s surface in proportion to the number of people served? He is producing a conference in three weeks that I will attend shortly after this article is broadcast from Ecocity Builders too. It is odd and interesting that much of his motivation at the extreme vertical axis of 3-D is exactly the same as that of David Hall at the extreme horizontal plane of 3-D just barely getting started: maximum agricultural production for humanity entering uncharted territory of limits of many kinds and threats like climate change and political destabilization. The other thing quite conspicuous is their exactly opposite attitude toward population, Hall believing in filling up the Earth with people while King is terrified of what will happen if that happens, so worried he takes the most extreme notion of verticality I know of among city designers, if integrating a strong element of the horizontal. A number of times now talking with Ken during my last trip to China, and many times scattered over three days there, I’ve looked into his gentle, troubled yet determined eyes and heard a slight tremor of real fear in his voice talking about the need for agricultural land and a reversal of population growth before those two end up in a real train wreck. He doesn’t think we have much time left to figure it out and get moving. This may be one of the reasons Ken’s solutions seem so… overly tall, maybe to exaggerate for attracting attention in exactly in the way tall buildings already do? My photograph of Paolo Soleri in 1973 at his “Two Suns Arcology Seminar” at Arcosanti, Arizona where he took that passive solar design idea from single building to whole city design. In the first years of the 1960s Paolo was shifting from designing single buildings, sculptural dams and bridges to laying out imaginary cities in the very real landscape of the now, the “now” being a time of technological Progress with a capital “P,” a weird time of industrial optimism growing through the soil of threatening nuclear holocaust. One of his big projects was called Mesa City, an imagined city covering an enormous area on the top of a hypothetical mesa, which for those far from the US Southwest, is a flat-topped mountain. The word means “table” in Spanish. His drawings covered enormous areas too, much longer than the table he worked on, so they were rolled up at the ends as he worked down the endless scrolls of butcher paper. He was laying out the city in pretty much the zoning compartmentalization of the time, though in gorgeous lines and forms, but still business centers here, residences there, manufacture somewhere else, school in another quarter and so on. Strong in his mind was his experience working with Frank Lloyd Wright at Wright’s studio/workshop/office/living complex called Taliesin West a few miles northeast of Phoenix, Arizona. Wright celebrated a sprawling car-based ideal and one famous version of that was Broadacre City – a name that pretty much says it all, like an endorsement for the products of the auto industry. Wright celebrated cars and high mobility in two dimensions and even imagined commuting around suburbia by helicopter. Even deeper in Soleri’s mind, no doubt, were the memories of growing up among the mountain towns of northern Italy, with their narrow ancient pedestrian streets buzzing with activity, replete with every product needed for a graceful life available within a short to modest walk. There at his drawing board he stared down at great expanses, and once he told me, it seemed sooooo stretched out. Something uncomfortable about it. The distances just didn’t make basic sense. It was as if the paper were actually a sheet of rubber, he said, stretched out to some sort of distorted distance. What if it all just sort of sprung together, with various functions, still somewhat separate, as the organs in our bodies are separate, but overlapping in a 3-D arrangement? His Mesa City was a beautiful drawing. His future cities would be an exploration into a hopefully beautiful new kind of city – like a complex living organism. He immediately saw his new “organisms” (cities) as existing in their proper relationship to the land, functioning as members of the natural and human created ecologies surrounding and sustaining human individuals and cultural/economic life. Shortly after that, more like the middle of the 1960s when I met him, Soleri began reading the books of paleontologist Jesuit priest Pierre Teilhard de Chardin: The Phenomenon of Man and The Future of Man. Teilhard, running contrary to Catholic doctrine, was allowed to pursue his studies in evolution so long as he did not publish in his life time. He died on Easter day, 1955. Immediately his friend moved to print his works. One of Teilhard’s key concepts was that evolution proceeds toward more miniaturization and complexification in the whole cosmic swath of time in the universe. Simple gas clouds of almost nothing but hydrogen after the “Big Bang,” through mutual gravitational attraction, condense into small points of matter called stars, small in relation to the vast whole universe. There in the stars under building pressure and heat, thermonuclear reactions took place producing the full range of the natural elements – complexity hurtles forward as the full range of natural elements are cooked up. Then Many of these first generation starts start exploding in supernovas casting their then complex new elements into space and a second generation of stars forms along with dust and gas clouds, asteroids, comets and planets, again by gravitational attraction, but now with elements and all sorts of new chemicals and simple associations of proximity – mixing on the molecular scale – in a world vastly more complex than even in the stars: another level of complexification and miniaturization at the same time. The Earth as it was cooling, getting close to the time of the appearance of life, as illustrated by astronomical and space travel artist Chesley Bonestell for the cover of Life Magazine’s special coffee table sized book called The World We Live In. As a side note, Bonestell was involved in not only many, maybe most of the popular pointed nose rocket spaceship illustrations of the 1950, but worked earlier in the architecture firm that, with some influence from him, designed the similarly shaped, ever iconic Chrysler Building in New York City. Then in Darwin’s famous “little warm pond,” a stunning further reduction in scale and increase in complexity, with the addition of a little electrical sparking or exotic energy-releasing chemical reactions, a yet more complex thing called life emerges as another leap in the miniaturization complexification process. And then lastly – to date anyway – the appearance of consciousness and conscience in life itself in our animal friends and especially in us. Paolo, shortly after I met him, was already saying cities could not only fit into healthy relationships with the environment, but could even be harmonious with that direction of cosmic drift. But suburbia went the other way: toward gigantic spread out consumption of land, machinery, architecture that consumes materials massively because of sharing relatively few walls, floors and ceilings as scattered small buildings and toward enormous consumption of energy. In 1970, the year Soleri founded Arcosanti, his experimental town between Phoenix and Flagstaff, in one of my several interviews I asked him, “What were you doing when you realized that your compact highly complex and three-dimensional city designs actually fit that description of the patterns of normal healthy change in the universe? What was your state of mind?” I’d prefaced that saying many insights or discoveries of scientists and epiphanies of artists of various sorts come to them in moments of almost dreamy relaxation and thoughtfulness. Such is the story of Newton contemplating the falling of apples producing his formula for the attraction of gravity and Charles of Charles gas law describing the relationship of temperature, pressure and volume. That formula was written down on a pad of paper Mr. Charles kept beside is bed for ideas that appeared to him when he was actually so relaxed as to be asleep. When I met Soleri he already had the 3-D notion for cities down pat. Vertical and horizontal was already integrated whole cloth. Next up for him was his effort to explore every possible related thing, trying to communicate about it through writing, drawing, building models, traveling and speaking around the world and trying out the real deal, attempting to build a thorough-going, a genuinely complete city of the sort I think of as a particularly compact type of ecocity. And when the whole town was linked three-dimensionally, the vertical infused with the horizontal and vice versa, in essentially a single interlinked building, Soleri would call it an “arcology,” a fusion of architecture and ecology functioning within the healthy parameters of ecology, advancing the vector of time into an the adventure of a deeply creativity future, with us and our cities participating in literally creating next steps in the evolution of the all and everything. So then all of us who are working in shifting from the kind of almost impulsively random patterns of development following our half-thought-out desires, all of us who are joining in the effort to refine the details of the city “like” a living organism are on board as key folks in a drama as large as the universe. True, compared to all that, we are ironically and incredibly less than microscopic in size and lifespan. Yet here we are playing this role or the sharp leading point of evolution, trying to get real vis-à-vis what is beginning to look like the best understanding of much healthier ways of being, as Kenneth King, David Hall and many others now think of it as seeking and hopefully finding “a solution for sustainable living” – big time. Richard Register is an eco-pioneer and founder of Ecocity Builders. 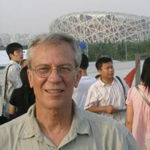 He lectures and consults internationally and has authored several books of illustrations and ecocity design principles. Get his latest book, World Rescue – an Economics Built on What We Build online or directly from the author by emailing ecocity (at) igc (dot) org.